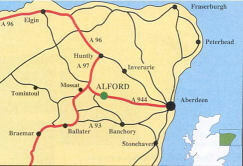 in the village of Alford. The congregation of Howe Trinity seeks to be forward thinking and outwardly focused. It was formed in 1999 by the union of the parishes of Keig, Tullynessle & Forbes, and Alford. The former Alford East Church is now the centre of worship of the Howe Trinity Congregation. 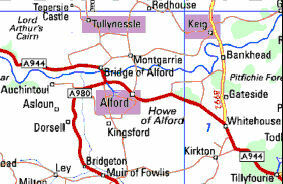 It is located towards the east end of Alford's Main Street, directly opposite W&R Murray's car showroom. Still not sure where to find us? Regular Sunday Worship takes place usually starting at 10am. There's a Sunday School for the children in the new church hall to the rear, and also a creche for younger children. Visitors to the area (or new residents) will be made especially welcome. After the service, everyone is invited for tea or coffee in the new church hall. Howe Trinity also stage various fund raising events. These include coffee mornings, soup & sweets, social evenings, quiz nights, and much more. The church and hall also provide a choice of perfect auditoriums for music events and concerts. The Minister for Howe Trinity Parish is the Reverend John Cook. Rev Cook has ministered to the parish since 2000, supported by his wife and family. Of first and foremost importance in any Christian organisation is the act of worship. In Howe Trinity this is no exception. We have a worship group which meets regularly and helps steer the path the worship should follow. All are welcome to join and participate in this group. Throughout the year there are special family services eg. easter, harvest thanksgiving, thinking day (for local young uniformed groups), Christmas, and many more. Communion Service also take place on the last Sunday of April and the last Sunday of October, and on Christmas and Easter Day. The minister is happy to provide a Home Communion service for any housebound member. Contact your elder, or the minister directly to arrange this. The Parish supports and encourages several social groups and activities throughout the area. These include the Guild, the After 8's, and various other groups aimed at both adult and youth interests. Howe Trinity publish a quarterly newsletter which is distributed to all households in Alford, Keig and Tullynessle. This allows everyone living in the Howe Trinity Parish to be informed of happenings in the life of the Church. In 2008 Howe Trinity opened its new church hall following several years of planning and fundraising. This was an exciting and visionary project for a recently formed congregation, providing a base for the work of the church's organisations, and a facility for wider community use.